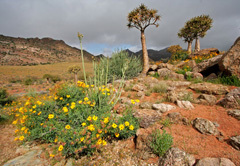 Although the Northern Cape is the most arid of all the South African provinces, it is still abundant in life. 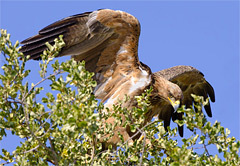 In fact, its unique climate and topography mean that it is home to an entirely unique collection of fauna and flora, and that the game reserves and parks that are found here are excellent for authentic African safaris with a twist. These reserves also boast San rock art and diamond diggings to add to the magic and allure of this South African adventure. 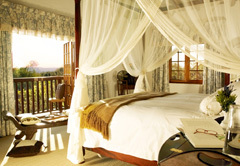 The game reserve accommodation ranges from rustic lodges to luxury retreats. One of the highlights of the Northern Cape is Africa's first formal trans-border conservation area, the Kgalagadi Transfrontier Park in the Kalahari Desert. This is about 1 000 kilometres from Cape Town and more than 900 kilometres from Johannesburg. The animals that can be seen in this environment are hardy and intriguing. They include jackal, African wild cat, bat-eared fox, wild dog, wildebeest, hyena, giraffe, lion, and springbok. 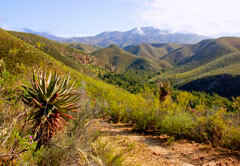 Other natural gems in the province include the national parks; such as the Augrabies Falls National Park, Mokala National Park (where the rhino and other animals are believed to be more approachable due to there being no predators in the park), and Richtersveld National Park (home to caracal and leopard). 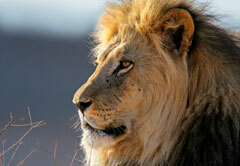 Safaris can be self-driven or with the aid of a guide in a comfy safari vehicle. The guide will share his or her fabulous insights into the animals and their starkly beautiful home, which adds so much more to a bush safari. Take the West Coast route back to Cape Town after your Northern Cape safari to enjoy the charming fishing villages of Paternoster and Langebaan. Click on the game reserve, national park or nature reserve you wish to visit on the Northern Cape map or select from the full list below, to view additional information about the reserves and for listings of all lodges listed in the relevant area.